A simple solution for complex oncology care. Cancer care shouldn’t happen in a vacuum. Together, our Oncology Management and integrated EHR help you treat the whole patient. Designed specifically for oncology centers, MEDITECH’s solution centralizes the tools you need to manage lengthy treatment plans and ensure safe, coordinated care. Streamline workflows for your entire staff. No more logging on to other systems. Centralize scheduling to coordinate multiple appointments and improve efficiency. 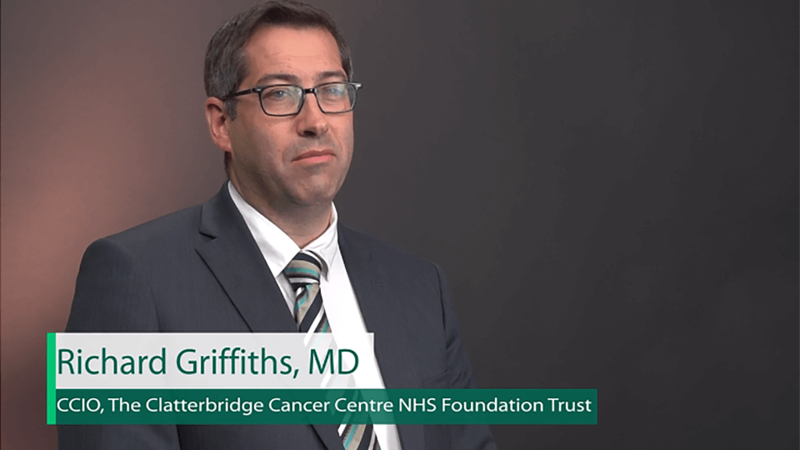 Clatterbridge Cancer Centre NHS Foundation Trust (Wirral, England) is experiencing greater efficiencies in care delivery, thanks to MEDITECH's Oncology Management solution. Download our case study to learn how CCC oncologists have reduced ePrescribing steps from 15 down to 8 when ordering chemotherapy with multiple cycles. 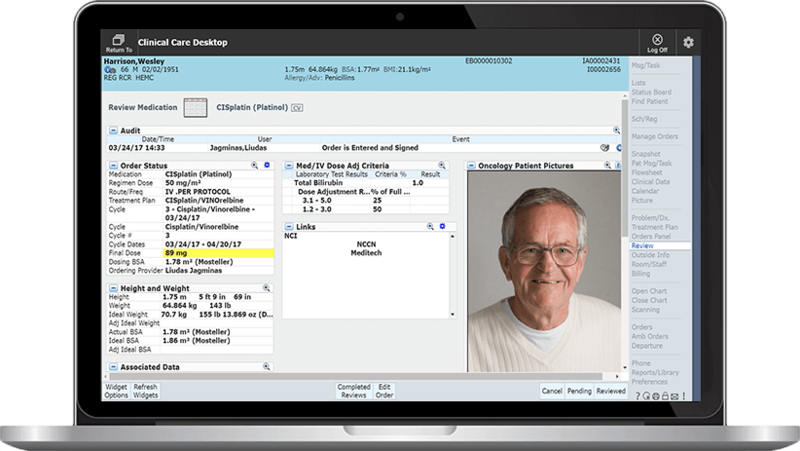 Centralized Desktops: Access your most common clinical routines from one location, for consistent and safe care delivery. Role-based Status Boards: View real-time patient information on interactive status boards for oncologists, nurses, pharmacists, social workers, and more. Treatment Plans: Order and manage treatment plans from a single area. Access National Comprehensive Cancer Network® (NCCN) Templates® — the industry gold standard — as standard content for treatment regimens. 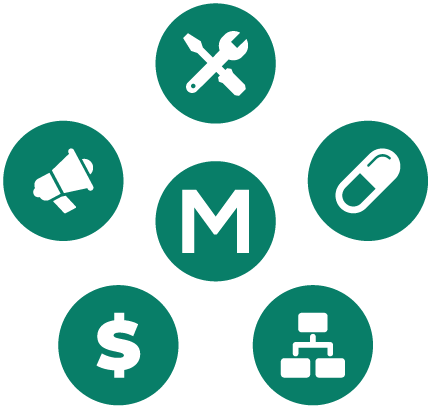 Map out treatments months in advance with multi-cycle ordering capabilities. Clinical Flowsheets: View and trend data from multiple sources in one location, streamlining care delivery. Tailor flowsheets to specific diagnoses or provider preferences. Widgets: Personalize your summary screen to show what’s most important to you: consolidate data from across the EHR and clinical images captured in the clinic for easy viewing. Tasking/Messaging: Communicate with oncologists, nurses, social workers, and navigators across the clinic, and staff throughout the enterprise, regarding patients and their accounts. Oncology Management at Humber River Hospital. Learn how MEDITECH’s integrated Oncology Management solution has improved patient safety and helped Humber River Hospital (Toronto, ON) become North America’s first fully digital hospital. Download our white paper to learn how MEDITECH’s Oncology Solution Integrates Cancer Management to increase efficiency, improve patient outcomes, and better coordinate care.